Outdoor rooms from SRA Home Products allow homeowners in Cherry Hill, New Jersey, to enjoy the outdoor living space around their home without the constant threat of inclement weather, bugs, and other nuisances putting a damper on the fun. Whether you use it for crafting, gardening, exercising, or hosting parties, an outdoor room will allow you to enjoy nature from the comfort and protection of an enclosed space. Screen rooms – These outdoor rooms feature removable vinyl sashes that block up to 99 percent of harmful UV rays and solid thermal roofs that deflect the sun’s heat. For homeowners toying with the idea of adding a sunroom down the road but aren’t ready to commit just yet, this outdoor room makes a great first step, and can easily be transformed into a sunroom at a later date. 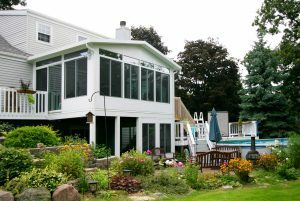 Sunrooms – These outdoor rooms feature thermal core EPS insulation and highly energy efficient windows, which will help your sunroom’s interior effortlessly maintain a more comfortable temperature during those hot summer months. Finally, all of our outdoor rooms are expertly installed by our own factory-trained and -certified employees – never subcontractors – each of whom has an average of 15 years working with us. This allows us to ensure that the technicians who enter your home are not only trustworthy, but also have the knowledge and experience necessary to install your outdoor room in a professional and timely manner, minimizing the disruption this home improvement project will have on your daily routine. Our installers’ expert craftsmanship has helped us earn an A+ rating with the Better Business Bureau, an achievement that we remain proud of and work to uphold through every single installation we complete. If you would like to learn more about the benefits of the outdoor rooms we install in the Cherry Hill, NJ, area, contact SRA Home Products today. When you do, be sure to ask about TEMO’s limited lifetime transferrable warranty on sunrooms, screen rooms, and other outdoor living products.